In addition to the checklist information below, be sure to check out our 2012 Panini Prominence Football Rookie Variations Guide. Good: Nice polished design, Variety of Rookie Variations, Wide range of players represented on checklist. Bad: Currently overpriced at $90-$100+ per box, Cheap look to some of the rookie autograph variations, Weak performance of singles on secondary market. The Bottom Line: 2012 Panini Prominence is a solid product. It's one of the best looking Panini sets in recent memory and sports a wide variety of autographed rookie variations that add some exciting chase appeal. But when all is said and done, Prominence simply doesn't offer the same value, potential returns, and overall appeal as products like 2012 Topps Finest, 2012 Topps Platinum, 2012 Topps Inception, or even Panini's own preseason offering ,2012 Prestige. But if you see something that really jumps out at you in Panini Prominence, there's enough potential to warrant giving it a shot - especially if you can snag a box for anything south of the $85 mark. When Panini purchased Donruss several years ago they proceeded to absolutely butcher the long time American sports card company's card designs. From Classic to Prestige to Elite, it all went downhill. Fast forward to 2012 and I think Panini has finally righted their course by bringing some consistency back to the quality of their set designs. Nowhere is this more evident then with Prominence Football. The base set looks crisp, high end, and vibrant, as do the autograph subsets and autograph rookie variations - with the exception of the Rookie Field Plates which are eyesores and look like they should be in a Leaf set rather then a real card manufacturer like Panini's product. The base set is comprised of 100 active veterans and stars, 50 NFL Legends and a whopping 100 rookies. Without a doubt the strongest component of the overall checklist is the inclusion of the 6 autograph rookie variation subsets that feature the 35 players from the 2012 NFLPA Rookie Premiere. However rookies are also the set's largest drawback, simply because there are too many rookie scrubs taking up space. 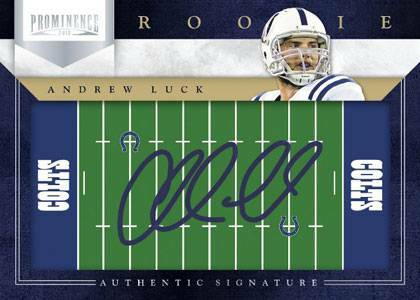 Outside of the autograph variation subsets that feature all the big name rookies like Andrew Luck and RG III there are 65 other rookies whose autographs round out the base set. And they consist almost exclusively of Offensive Tackles, Defensive Backs, and low-round skill position players. My biggest issue with 2012 Panini Prominence Football is that it doesn't deliver sufficient value for the price. Each hobby box, which currently retails for around $100, only guarantees 2 autographs, along with a third hit that can be either a jersey card or another autograph. My box, along with all 4 of the other box breaks I watched other people do of this product resulted in the same formula - 1 rookie variation auto, 1 scrub rookie auto from the Rookie Signatures subsection of the base set, and 1 uni-color jersey card. I'm not sure what the odds are of a box's third hit being an autograph versus a jersey card, but at $100 per box there needs to be three guaranteed autographs - as is the case with 2012 Topps Inception, which can be currently had for $80-$85 per box. If this product ever falls close to the $70 per box range, I would boost my review by a full point. So much hinges on which way that third hit goes that Prominence can easily leave you feeling dissatisfied, though the lack of guarantee in the third hit also has the potential to lead to an unexpected surprise if you are one of the lucky ones that comes up big. There certainly is fun to be had with this product - just not as much as the price tag might lead one to believe. 2012 Panini Prominence Kirk Cousins Autograph Card BGS 9 Auto 10. 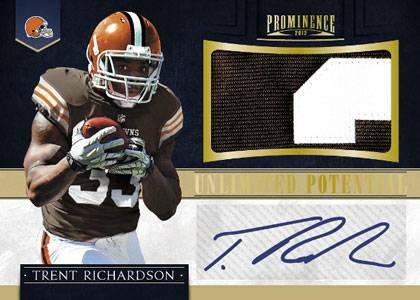 For those hunting for hit-centric rookie cards, 2012 Panini Prominence Football may be the place to look. The 35 players who participated in the 2012 NFLPA Rookie Premiere each have five distinct rookie cards. They're all autographed too. All numbered to the same amount, rookie subsets include Autographed Nameplate Letters, Autographed NFL Team Field Plates, Autographed Team Logo Patches, Autographed NFL Team Helmets and Autographed Event-Worn Jerseys. A similar Field Plates design is reminiscent to signature cards found in 2010 Panini Epix and 2011 Panini Gridiron Gear. Depicting an overhead view of a football field, the distinct look stands out in a crowded crop of signature cards. It's also a nice alternative to sticker autographs. The logo patch autographs have a similar design to cards found in 2011 Panini Rookies & Stars. They use a large fabric area for a signing surface with a manufactured patch in the top corner. The result is a very textured look. 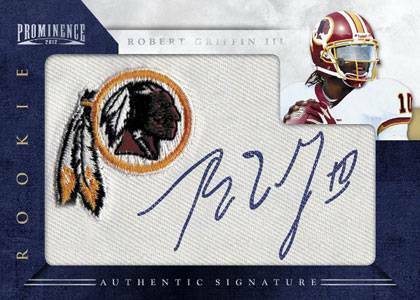 Although inserts and not official rookie cards, Unlimited Potential Materials Signatures Prime (35 cards, #/49 or less) bring more rookie autographs to 2012 Panini Prominence Football. But this isn't strictly a rookie product. 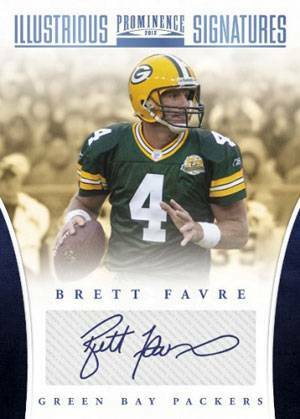 The 30-card Illustrious Signatures (#/99 or less) centers on football's all-time greats. 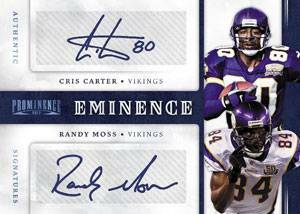 Team collectors can look for franchise tandems with the 15-card dual-autograph Eminence Combo Signatures set. Triple-signature versions are numbered to 10 or less. 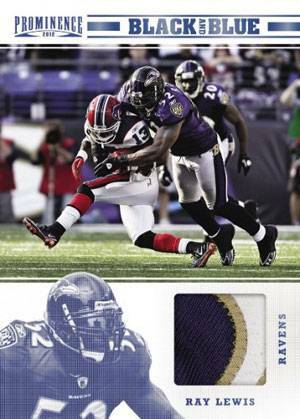 Panini continues to highlight the men on defense, this time with Black & Blue Materials. Each of the 30 cards in the set are numbered to 49 or less. Swatches are a mix of game-used and event-worn pieces. 2012 Panini Prominence Football has eight cards per box. Two autographs are guaranteed along with a third hit. Boxes are rounded out by five base cards that highlight veterans and retired players. DONTARI POE 2012 PROMINENCE APPRENTICE INK CHIEFS ROOKIE AUTOGRAPH AUTO RC 99!! I just purchased a box of Panini Limited and went to another hobby shop and purchased the Prominence product. I actually enjoyed the Prominence as all cards are printed on a thicker backing. This does have it’s draw back, chipped corners. My Marshawn Lynch card was culprit to this anomaly. Luckily Panini has great customer service and will replace my card. Great design, fantastic quality, and superior print. For those that enjoy the thicker cards, this is a great choice!